Probasics Transport Wheelchair is a lightweight transfer and mobility chair that weighs a mere 27 lbs. Featuring a fold down back for easy storage, this transport and transfer chair is equipped with swingaway removable footrests, durable nylon upholstery and the added safety of push-to-lock rear wheel locks and a seatbelt. This is a light, easy-to-use wheelchair that provides ultimate patient security and comfort. 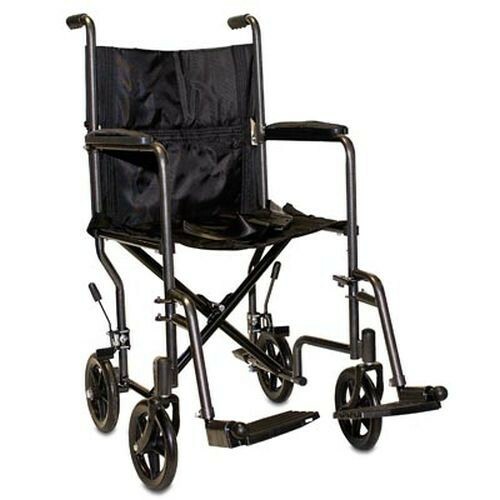 Probasics Transport Wheelchair has a weight capacity of 300 lbs. and is available in either 17 inch or 19 inch seat widths. Designed with a stylish silver vein finish, this is the ideal lightweight transport and transfer chair for patients of all shapes, sizes and ages. You may also be interested in similar mobility chair products, such as the Pollywog Wheelchair and Transport Chair by Drive. Features a fold down back for easy storage and swingaway removable footrests. Designed with durable nylon upholstery. Has the added safety of push-to-lock rear wheel locks. Weighs a mere 27 lbs. but has a complete weight capacity of 300 lbs. Available in either 17 inch or 19 inch seat widths in a stylish silver vein finish.